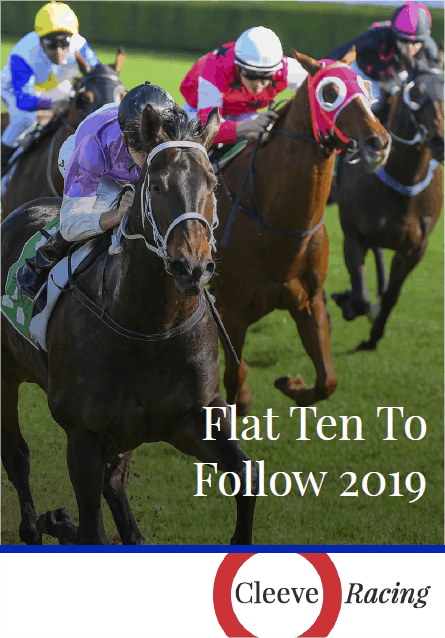 With the start of the Flat Season fast approaching I thought it was time I released my 10 horses to follow list for this year. We've had a lot of success over the years simply backing all 10 from the list whenever they run including last year when we had the St Leger winner and the Northumberland Plate winner (had also won previously at 14/1). He started off in a 7f Newmarket Maiden as a 25/1 outsider but showed immense promise when running on into 4th behind decent Listed race performer Lexington Times (Richard Hannon Jnr.). Incredibly, the 2nd, 3rd, 4th, 5th, 6th, 7th and 10th horses home from that race ALL won next time out (the 8th horse won the next start after). Latharnach went to Sandown to win his maiden and did it well to score by 2½ lengths and 2¾ lengths from Tom Hark and Elm Park. You may recognise the third horse home as he went on to win the Group 2 Royal Lodge Stakes and the Group 1 Racing Post Trophy later in the Season. For his final start of the Season he went back to Sandown for a 4 runner Novice Stakes race where he won easily from Roger Charlton's previous easy Sandown winner Time Test. He's run in some hot races and beaten some very decent performers and looks sure to go on to better things this Season. He currently has an entry in the Newmarket 2000 Guineas. He started his career in Ireland with Joseph Murphy and ran second on his debut behind Listed race winner Convergence. He then only just scraped home in his maiden from an Aiden O'Brien runner but there was 6 lengths back to the third. The form of that race hasn't really worked out but Vert De Grece showed he was no slouch when just going down to the top class Aiden O'Brien runner Gleneagles by ¾ length in the Group 2 Futurity. That was good enough for a big money sale to Britannia Thoroughbreds who shipped him to continue his career with Roger Varian. Given a couple of months to settle in to his new surroundings his first start for the new stable didn't come until the end of October but it was well worth the wait as he stormed home for a 4 length win in the Group 1 Criterium at Saint Cloud. After that win a Group 1 Classic campaign looks on the cards. She started her career quite early when making her debut at Leopardstown in May but it wasn't until her 3rd start at Roscommon when upped to 7f she was able to break her duck. She then went to Leopardstown for a Group 3 race which she took in fine style with some pretty decent fillies in behind. The second went on to win a Group 2 and was 2nd in a Group 1, the third went on to win a Group 3 and the fourth won a Group 2. Jack Naylor herself went on to win her next start in Listed company where she had the subsequent Group 1 Fillies Mile winner Together Forever 2 lengths back in third. For her last start of the Season she went to Longchamp for the Group 1 Prix Marcel Bousacc and ran a staying on third looking like a filly who'd had a hard Season. Her Group 3 win at Leopardstown has some of the best Irish formlines on offer for the fillies from last Season. She looks a fine staying filly in the making and has entries in both the Irish 1000 Guineas & Oaks. After a pretty decent campaign on the All Weather at the start of last year Bute Hall transferred his good form to the turf in his first run of the Season in a class 2 handicap at Thirsk. From a rating of 83 he finished 3rd to a previous Royal Ascot handicap winner in receipt of just 5lb. He then ran three times in May without much luck although he certainly wasn't disgraced in any of his races. We didn't see him again until returning on the All Weather in February where on his first start he went off the 11/4 favourite for a 12f class 4 handicap. He didn't get the best of runs but ran okay after a long break to finish 4th. On his last start he was upped to class 2 company but ran poorly to finish last of 6th. He now starts the Turf Season from a rating of just 78 and off that kind of mark he is more than capable of bagging a class 3 or 4 handicap at one of the Northern tracks. One of the races I always like to take horses from is the Britannia Handicap at Royal Ascot. Madeed is one such horse after an encouraging staying on 3 length 7th of 30 at 33/1 in last years renewal. He likes to race up with the pace, which is a hard a way to win one of these big field handicaps at Ascot, but despite being headed at the furlong pole he stuck on all the way to the line and finished 2nd of the 10 that raced on the far side. He then went to Glorious Goodwood, where he was stepped up to 10f, and ran 3rd in a decent handicap behind two Mark Johnston runners. He came back to Goodwood for his next run at the end of August where he ran another solid race in defeat when going down by a length and a half trying to give 7lb to the David Simcock trained The Corsican (a winner since and now rated 101). For his last start of the Season he was dropped down to class 3 for another 10f handicap where not surprisingly he was sent off a short priced favourite. All looked to be going to plan when he made his move coming down to the furlong pole but he looked a little one paced and couldn't reel in the front two and finished 3rd. That last run wasn't a great way to end the Season but it does mean connections can start this year with a nicely handicapped horse for the big Class 2 handicaps. He had a fantastic Season in 2013 winning two races and running really well in some big field handicaps in late Summer/Autumn (3rd of 18 Glorious Goodwood, 5th of 27 Ayr Silver Cup & 6th of 27 Ascot Champions Day). Last year things didn't go so well in his four starts although there were excuses at least for his last run (didn't stay 9f). His Season ended in mid June so there may have been a problem that connections wanted to get sorted but it does all mean he gets to start this year off a 87 which is his lowest since June 2013. He seems to run well in the big field races and looks just the sort for the Lincoln consolation race and is worth noting in any of the 7f handicaps that are run throughout the year at Ascot . The London Gold Cup handicap on Lockinge day has long been a springboard for 3yo's to go onto Group glory and last years renewal looked a pretty classy affair. Cannock Chase was driven out to score from the other joint favourite Windshear (4th in the St Leger later in the Season) by just over a length. From there the winner went on to Royal Ascot to contest the Group 3 Tercentenary Stakes where despite being the second lowest rated horse was sent off the 7/4f. He didn't let his supporters down and once again was driven out to record victory by 1½ lengths from 107 rated Mutakayyef and 104 rated Postponed (won Group 2 Voltigeur Stakes at York later that Season). We didn't see him again after that win but with the form boosts the placed horses gave Cannock Chase he now has a revised rating of 111. He looked an improving older horse for Sir Michael Stoute, who does so well with these sorts, and looks just the type for the Brigadier Gerard run at Sandown's evening meeting in May. On the face of it he didn't have a very good year last Season but the simple fact is he doesn't stay 6f. His four runs over 5f last year read 5th of 11 to Sole Power on his debut (beaten 2 lengths), 3rd in a Group 2 at Glorious Goodwood, 4th in the Group 1 Nunthorpe (beaten 1 length) and 3rd in the Group 1 Prix De L'Abbaye while his three runs over 6f read 12th of 13, 8th of 13 and last of 17. He's had a run in Dubai this Winter and is one to watch out for in the Group sprints over 5f this year (especially the King George Sprint at Glorious Goodwood). This globe trotting stayer started his career in France and then went to Australia for a failed attempt at the Melbourne Cup before switching to the Marco Botti stable in 2013. Since then he's been a revelation and in 7 starts has never finished outside the first 3 with a record in Group 1 staying races of 211. He began last Season with an impressive 5 length romp in Ascot's Sagaro Stakes before going down by ¼ length giving 4lb to Gospel Choir in the Group 2 Yorkshire Cup. He then missed the Summer due to his need for soft ground and wasn't seen out again until late October for a defence of his Group 1 Prix Royal Oak title. Despite his 4 month absence he stayed on well to win by a length from High Jinx who had previously won the Group 1 stayers race on Arc day. I'm sure we'll see him in all the Group Cup races this year and despite his advancing years will be one to watch out for when the going is soft. We'll finish up with a bit of a dark horse with Erik The Red having had just the two runs where he finished mid division each time. On his first run he contested a 16 runner 7f maiden at York where he finished a promising, staying on 7th as a 25/1 outsider behind Luca Cumani's shock winner White Lake (4th at odds on in a Listed race next time out). He then went to Doncaster for another big field maiden where on the back of his previous good run went off the 7/2 favourite. Again he showed promise to finish 6th to Commemorative (subsequently won a Group 3 and ran in the Breeders Cup Juvenile) despite hanging to the right. I'm hopeful he can pick up an average maiden before making his mark in handicap company.